We first glimpse Our Man eight days before he writes the letter, as he lays asleep in the cabin of his yacht. He awakes to a great bang and water begins to rush along the floor of his sleeping quarters before he can fully shake the dust from his eyes. A stray shipping container from an unseen cargo ship has crashed into the side of his vessel. The damage to the hull is massive and the lower quarters are flooded with water. There is something cruelly poetic about the image of this drifting behemoth that has found him. There is no sign of humanity for miles and miles in every direction, and yet here we see this unmistakably man-made structure. It has floated great distances just to reach Our Man and fatally cripple his only means of survival. Redford somberly and methodically goes about dislodging the craft from this mass of iron. He applies gauze and sealant to the hole to keep the waters at bay. He tries to radio for help even though his equipment is soaked. When it becomes clear that a massive storm is headed his way, he makes himself a meal, enjoys a glass of bourbon, and shaves. His expression betrays little of what he is feeling, but he behaves calmly in the face of impending destruction, as if following a guidebook. In the face of catastrophe, he acts as if meticulous procedure will save him. In less than a day, his ship will be at the bottom of the ocean and he will be stranded in a life raft with only a sextant, a water container, and some miscellaneous supplies. 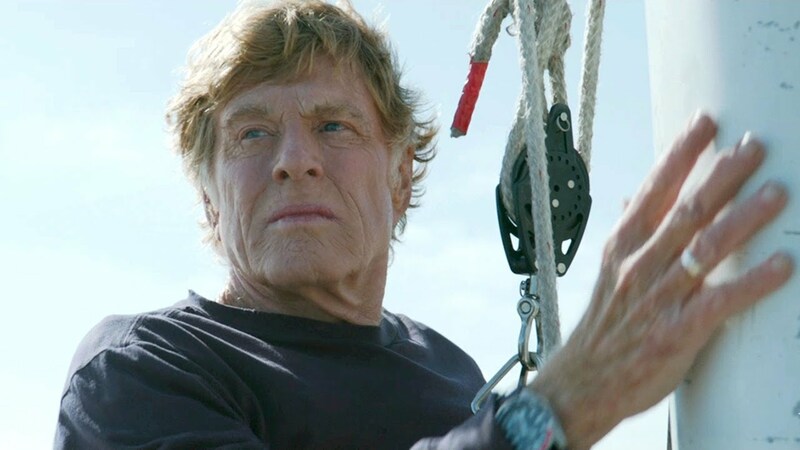 All Is Lost is about watching a man try to cinch a tourniquet around an increasingly dire situation and seeing how he responds when each new measure fails. To me, it contemplates the world we live in as an unconscious entity too locked into its own routine to care if we live or die. Chandor places Our Man in his own terrifying vacuum of space right here on Earth and makes it all the more unsettling for the occasional reminders of humanity we do get. The stray container that sends Our Man into his desperate spiral is filled with children’s shoes, the lost detritus of a human society that profits from it. Human error is the source of conflict in the film and yet Man is almost entirely absent, except for the one grizzled face that scans the horizon desperately for some kind of human assistance. We hear almost nothing out of Redford aside from a few cries for help and one exquisitely felt burst of profanity. The human world as shown in this film is every bit as monolithically callous a force as the pummeling seas and the thundering skies. When Our Man finally reaches the shipping lanes that he hopes will provide rescue, a cargo ship lumbers by without stopping or slowing. There is no sign of life on board, just more shipping containers. For all appearances, the ship could be driving itself. It is a sobering visual metaphor for an auto-pilot society, oblivious to the damage it causes to smaller lives and too distracted to help a lost human being. This film marks J.C. Chandor’s second effort as an immensely promising writer-director. His first film, 2011’s Margin Call, earned him a surprise Oscar nomination for Best Original Screenplay and many breakthrough awards. I was tremendously fond of that film, which took a Lehman Brothers-style office, in the dawning hours before the 2008 financial crash, and used it as the backdrop for a terrifically acted, densely scripted morality play about America’s money culture. That Chandor has transitioned from an unflashy, dialogue-driven first feature to a film that almost forgoes dialogue entirely shows that he has great confidence and ambition for a young talent. 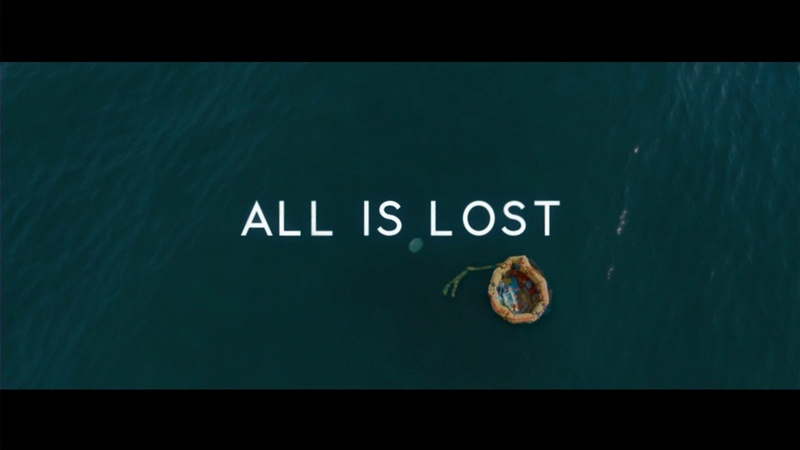 Under Chandor’s steady gaze, All Is Lost becomes a furious, unrelenting tone poem about a man both calling out for help and trying to save himself, and coming up short on both ends. It is a film about losing the house and then the foundation and then the very ground we are standing on; and somehow feeling that things still can and will get a whole lot worse. This could have been a dreary and deadening experience, but Chandor’s camera does an exhilarating job of communicating the feeling of hopelessness in visual terms. His images are invigorating in their fatalism. During a monstrous storm, Redford goes down into his cabin and sees the ship’s window is parallel to the sea floor. The porthole holds nothing but murky water and the ocean has now become a living, breathing character. One that desires to swallow up Our Man’s existence. Chandor gives us plenty of shots of the camera at water level, presenting the depths as an inexorable reminder of a worsening crisis. 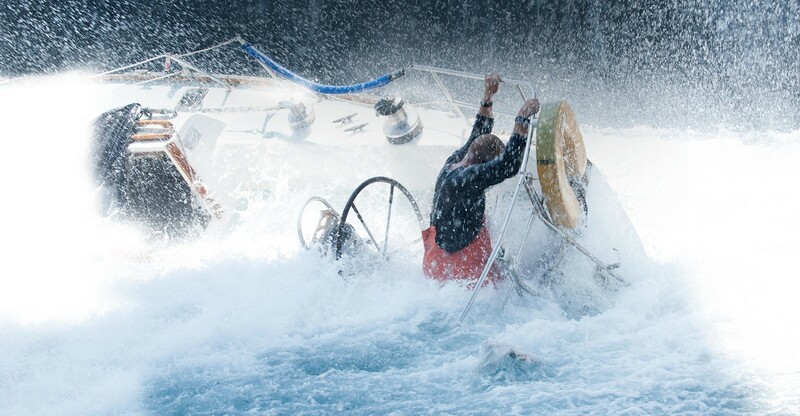 For a film set in a tropical location, All Is Lost is frigid to the touch. Our Man is a rugged rock of a survivalist who betrays few outward emotions and scarcely ever drops his guard, even in solitude. He is a protagonist fit for Jack London, the kind of tough, collected stoic who carries the American can-do work ethic in his blood. Our Man confronts each new setback with quiet resolve, but his ingenuity and focus is always met with more strife, another foot of bottomless ocean rising up around his tiny sliver of dry land. And then the ship eventually belongs to the depths, but at least he still has his life raft. Until the hungry waters come calling for that too. Chandor is skewering the old romantically American notion of rugged individualism, even questioning its real value in a world that has become too systematic and automated to pay attention to human voices. However, I think he also respects the courage and willpower that makes a man like Redford soldier on in the face of overwhelming defeat. In the end, it is an examination of what makes a man press forward when the universe says there is nothing left for him to do but die. 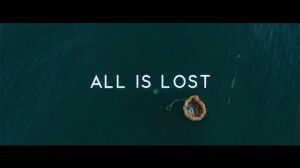 All Is Lost is both a biting allegory about the insignificance of individuals in a bustling, globalized society and a stirring ode to the value of screaming our names into the void anyway. Refusing to die. What could be more human than that?